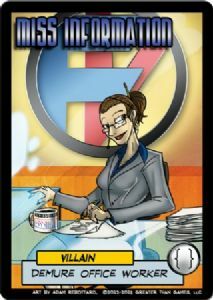 A 27 card mini-expansion to Sentinels of the Multiverse featuring a brand-new villain, Miss Information! The expansion contains a 25 card villain deck plus a villain character card and rules card. Also include a divider card for organization in the Enhanced Edition box.